OMG!!! Chocolate Peppermint Fudge is to die for. It’s great to make for special occasions like Valentine’s Day, Easter, Mother’s Day, Father’s Day, Birthdays and Christmas. TIP: This is best stored in the fridge. This fudge will last around 2 weeks (if you can stop yourself from eating it). Want to save 25% on all doTERRA Essential Oil orders? Join doTERRA as a Wellness Advocate to save on all orders and qualify for free oils and special promotions. 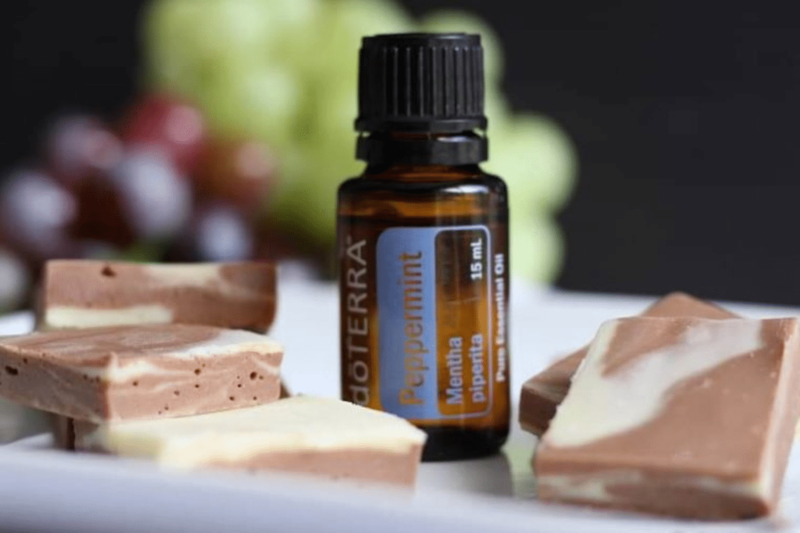 Read Why We Love doTERRA and Instructions on How to Join our AMAZING Team. Place white chocolate into mixing jug and blitz for 10 secs/speed 9. Set aside to use later. Place milk chocolate into mixing jug and blitz for 10 secs/speed 9. Set aside in a separate bowl to use later. No need to wash the jug. Add 1/2 tin condensed milk and 25g butter. Melt together for approx 2-3 mins/temp 60. Pour into a lined slice tin. Then working quickly repeat step 3 & 4 with milk chocolate and remaining ingredients (including the peppermint oil). Pour this over the white chocolate and swirl together with a butter knife. Place in the fridge to set for around 4 hours.